It seems that the masses and most of the financial media hate hedge funds and what they do, but why is this hatred of hedge funds so prominent? At the end of the day, these asset management firms do not gamble the hard-earned money of the people who are on the edge of poverty. Truth be told, most hedge fund managers and other smaller players within this industry are very smart and skilled investors. Of course, they may also make wrong bets in some instances, but no one knows what the future holds and how market participants will react to the bountiful news that floods in each day. The Standard and Poor’s 500 Index returned approximately 13.1% in the first 2.5 months of this year (including dividend payments). Conversely, hedge funds’ top 15 large-cap stock picks generated a return of 19.7% during the same 2.5-month period, with 93% of these stock picks outperforming the broader market benchmark. Coincidence? It might happen to be so, but it is unlikely. Our research covering the last 18 years indicates that hedge funds’ stock picks generate superior risk-adjusted returns. That’s why we believe it isn’t a waste of time to check out hedge fund sentiment before you invest in a stock like Zions Bancorporation (NASDAQ:ZION). Zions Bancorporation, National Association (NASDAQ:ZION) investors should be aware of an increase in hedge fund sentiment in recent months. ZION was in 42 hedge funds’ portfolios at the end of December. 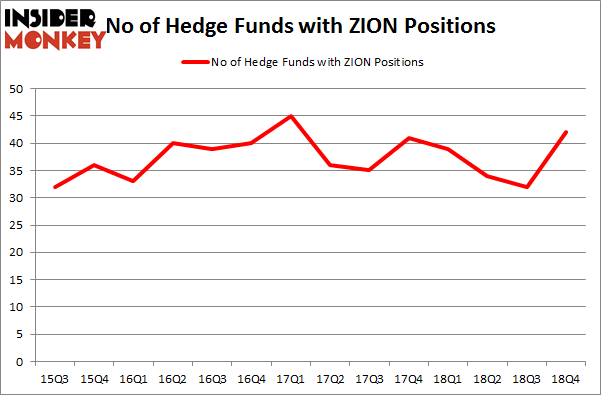 There were 32 hedge funds in our database with ZION positions at the end of the previous quarter. Our calculations also showed that ZION isn’t among the 30 most popular stocks among hedge funds. 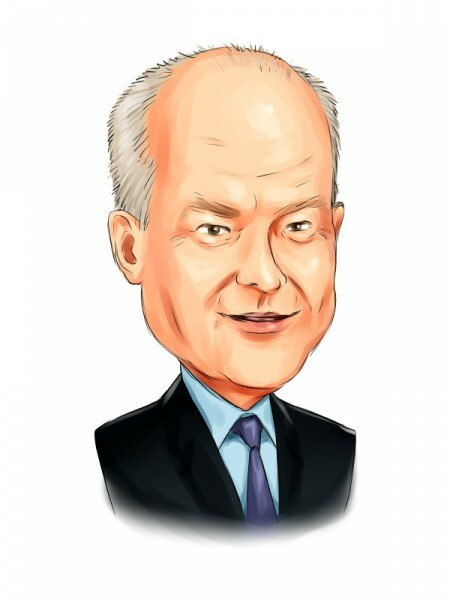 Let’s analyze the latest hedge fund action surrounding Zions Bancorporation (NASDAQ:ZION). What have hedge funds been doing with Zions Bancorporation, National Association (NASDAQ:ZION)? Heading into the first quarter of 2019, a total of 42 of the hedge funds tracked by Insider Monkey were bullish on this stock, a change of 31% from the second quarter of 2018. Below, you can check out the change in hedge fund sentiment towards ZION over the last 14 quarters. With hedgies’ capital changing hands, there exists a select group of key hedge fund managers who were upping their stakes substantially (or already accumulated large positions). More specifically, Millennium Management was the largest shareholder of Zions Bancorporation (NASDAQ:ZION), with a stake worth $159.4 million reported as of the end of September. Trailing Millennium Management was Citadel Investment Group, which amassed a stake valued at $123 million. Carlson Capital, Highbridge Capital Management, and Two Sigma Advisors were also very fond of the stock, giving the stock large weights in their portfolios. Consequently, key money managers have jumped into Zions Bancorporation, National Association (NASDAQ:ZION) headfirst. Point72 Asset Management, managed by Steve Cohen, established the largest position in Zions Bancorporation, National Association (NASDAQ:ZION). Point72 Asset Management had $20.4 million invested in the company at the end of the quarter. Jim Simons’s Renaissance Technologies also initiated a $15.9 million position during the quarter. The following funds were also among the new ZION investors: Sander Gerber’s Hudson Bay Capital Management, Jeffrey Talpins’s Element Capital Management, and Paul Marshall and Ian Wace’s Marshall Wace LLP. Let’s go over hedge fund activity in other stocks similar to Zions Bancorporation, National Association (NASDAQ:ZION). These stocks are ASE Technology Holding Co., Ltd. (NYSE:ASX), OGE Energy Corp. (NYSE:OGE), RPM International Inc. (NYSE:RPM), and Nordstrom, Inc. (NYSE:JWN). All of these stocks’ market caps match ZION’s market cap. As you can see these stocks had an average of 17.25 hedge funds with bullish positions and the average amount invested in these stocks was $288 million. That figure was $668 million in ZION’s case. RPM International Inc. (NYSE:RPM) is the most popular stock in this table. On the other hand ASE Technology Holding Co., Ltd. (NYSE:ASX) is the least popular one with only 7 bullish hedge fund positions. Compared to these stocks Zions Bancorporation, National Association (NASDAQ:ZION) is more popular among hedge funds. Considering that hedge funds are fond of this stock in relation to its market cap peers, it may be a good idea to analyze it in detail and potentially include it in your portfolio. Our calculations showed that the top 15 most popular stocks among hedge funds returned 21.3% through April 8th and outperformed the S&P 500 ETF (SPY) by more than 5 percentage points. Hedge funds were also right about betting on ZION, though not to the same extent, as the stock returned 17.6% and outperformed the market as well.